Alabama Admits Its High School Graduation Rate Was Inflated : NPR Ed Alabama boosted its graduation rate with questionable methods and now faces federal and state audits. It's hard to know yet how far off the rate is. "This is not one of those situations where it's just smoke. There is in fact fire," said Alabama's new state superintendent of education, Michael Sentance. The fire: Sentance revealed earlier this month that high schools there have "misstated student records ... resulting in diplomas that were not honestly earned." At a recent meeting of the state school board, he also admitted that Alabama's education department had not provided enough oversight. "This is a black eye for the department," Sentance said, "and it makes the education system here look bad, and in some ways undeservedly so." 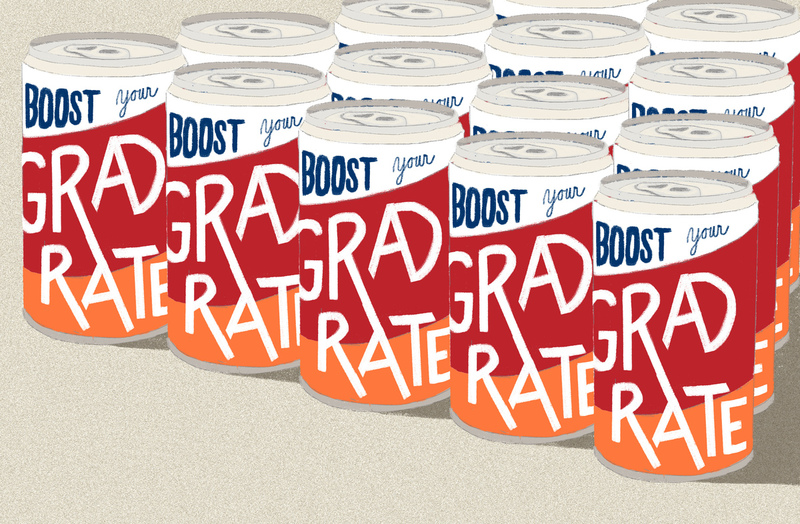 The revelations come as high school graduation rates have been rising across the country, nowhere more than in Alabama. Its rate, now at 89 percent, has risen 17 points since 2011. The average state increase was barely four points. Earlier this year, Alabama's previous superintendent said of the improvement: "Our school systems have been able to do unbelievable things." At some point, though, Alabama's meteoric rise attracted the attention of the U.S. Department of Education. Its Inspector General's office is officially auditing the numbers. The state is also doing its own review. Even without the results of those audits, Sentance acknowledged that the state had allowed two practices to artificially inflate its graduation rate. First, it had counted special-needs students who had earned an Alabama Occupational Diploma, which is not tied to the state's learning standards. It had also failed to flag districts for graduating students who hadn't completed the requisite coursework. "The lie was promoted. We were entirely misled." It's hard to know how wrong Alabama's high school graduation rate is until those audits are finished. Also, some policy changes legitimately boosted the rate. For one, the state encouraged scheduling flexibility and classes outside the traditional school day, which helps students juggle jobs and school. Also, improved record-keeping ensures students who transfer to other high schools and then graduate are included in the overall graduation rate, where previously many had fallen off the rolls. That improvement has been most significant in urban areas where families bounce between districts. But Bell sees real problems with Alabama's state-encouraged, locally customized programs meant to give students second chances. "I would hear from parents, I'd hear from teachers, I'd hear from local principals about grade changes," she says. "And in every case, practically, it was a result of the credit recovery program. The intent was to help, but what it became was a Band-Aid just to get them out the door." Bell isn't the first to raise red flags about the rigor of interventions like credit recovery. In fact, the NPR Education Team produced an entire series on such quick fixes, aptly named The Truth About America's Graduation Rate. Some educators, though, are fine with "getting [students] out the door," even if diplomas don't mean what they used to. "The piece of paper gives you the opportunity to play the game," says Terry Roller, the new superintendent of Talladega City Schools. Roller worries more about young people being able to feed their families than about graduation standards that don't keep up with the economy. "The industries that students are going to be working in in 10 to 15 years don't even exist," Roller says. "Who's to say that the standards that we have in place now are preparing them for that." "I didn't go the traditional route, and now I'm the head of a school district, making decisions to change the lives of young people. If we can give them the diploma and get them out the door, they have a fair shot. They can go out and create jobs and spark growth and change communities. ... I did it." The U.S. Department of Education might not see it that way. Its audit of Alabama's graduation data could lead to federal money being withheld if serious infractions are found. And then there's the state-led audit, which could trigger disciplinary action at the district level. In the meantime, Sentance is reorganizing his department to strengthen oversight, with the goal of making sure the state's future graduation rates are remarkable, not unbelievable.